We have a new guest reviewer tonight - Haru Haruka! 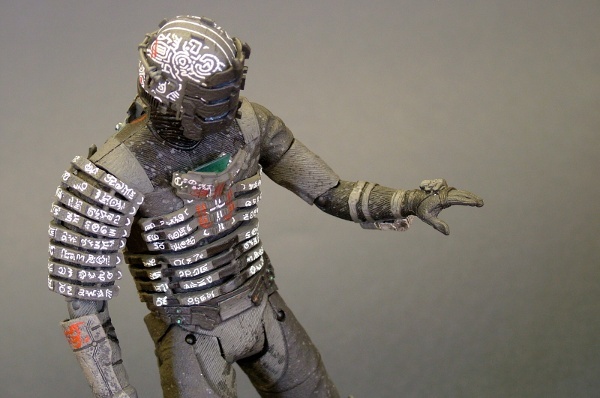 He's checking out the new NECA release from the Dead Space line - take it away, Haru! Dead Space is an expanding franchise. That, generally, I would suggest is a good thing. So far there has been the original game, a comic, an animated movie Downfall, the soon to be released Wii game Extraction; and finally, lastly and definitely least-ly, EA are in talks for a live action movie, directed by DJ Caruso. I bet we're all looking forward to that. Still, the original game has earned a plethora of well deserved awards. 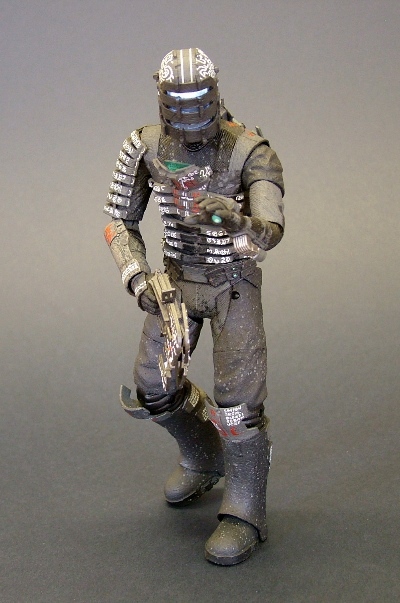 NECA has reliably or perhaps predictably, but nevertheless thankfully stepped in to produce three Dead Space figures based on Isaac Clarke, the protagonist from the video game. 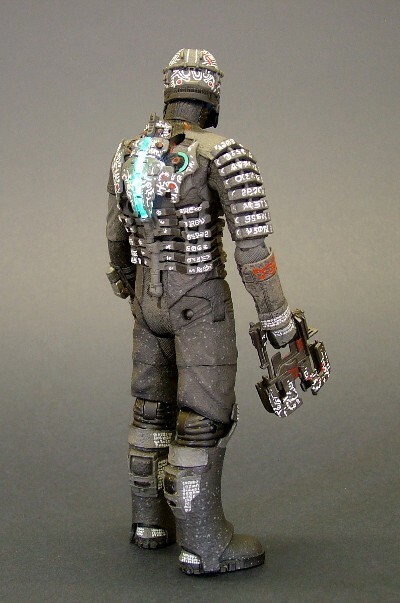 This review is of the variant that was available at SDCC, featuring Isaac in his unitology suit. One note of incident - the music featured rather awesomely on the official trailer is by an Icelandic band called Sigur Ros. The track is Sigur 7 (Untitled) on the ( ) album (often referred to as 'The Bracket Album'). Standard NECA clamshell deal here. It's concise and there's little waste in function. Graphically though, it's pretty lacking - the paper insert does it's best to conceal the figure from every possible angle. The images are quite dark and uninteresting and there are a few too many tpyos, er, typos. There are two twisties to deal with, one on the figure and another on the accessory - the latter giving rise on this sample to the age old problem where the gun has been strapped too tightly into an inadequate recess resulting in a banana gun. 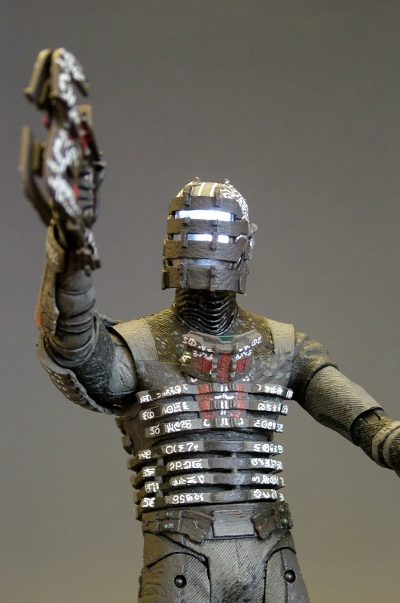 The character is a complex and highly detailed piece of design, and NECA has manage to pull it off wonderfully. There is a really solid sculpture here, with crisp, tight detailing, multi layered effects, and attached pieces that blend pretty seamless with the main body - especially the face plate pieces and piping at the back of the helmet and the ribbing on the torso. 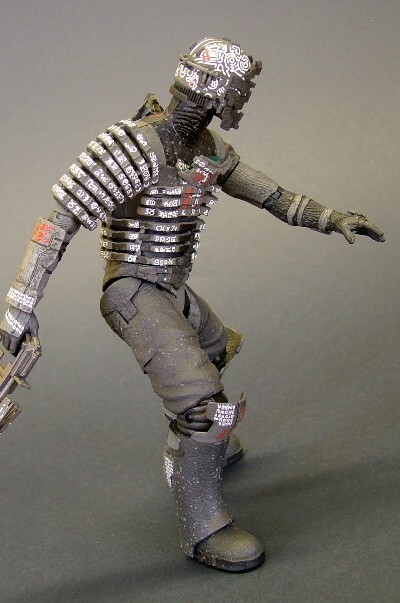 I always think that NECA tend to go overboard with the textures they apply to their sculpts. The scale difference usually leaves figures with sandstone skin and heavy corduroy jeans. That doesn't appear to be the case here - there is still a lot of texturing as you can see but it more closely matches Isaac's CG counterpart, and the subtlety on metal boots is very nice. My main ruffle with the sculpt seems to be characteristic of NECA, to give the figure a slightly skewed posture or gait. The legs are a little bowed, but mainly the torso has a skew to it where by his front armor is straight, but the back armor bunches up on one side, that would indicate he's leaning over, yet his shoulders are at the same level, and his hands reach the same length. Like I said, skewed. One other thing is that soles of the feet don't have any sculptural details like his CG counterpart, which is a shame really. The painting is very clean with no major problems. There are a lot of different blacks and grays used and they are all cut together sharply with very little error to speak of. There is an 'interesting' gray speckle used all over, which I'm not a fan of - I don't really see what it adds, and it's certainly not accurate. It kind of gives the figure a messy feel. It really could have done without it. The characters and symbols that adorn the armor, a selling point of this variant, are very well executed, and I didn't find any poor prints or missing areas. There are a few random streaks of dark gray on the light grey parts of his costume particularly on the groin, the left biceps and the small of the back you might be able to detect on the photos, and I'm really not sure what they were going for there. The packaging states over 20 points of articulation. Isaac moves at the head (true ball joint), shoulders (ball joints), left bicep, elbows (ball joints), wrists (right at least is a ball joint), waist (swivel), hips (those Mattel style rotation and abduction ones), thighs, knees (ball joints) ankles (ball joints). The articulation really does make for an impressive figure. The shoulder armor is flexible so as not to hinder the shoulder joint. The ball jointed wrist really works well with the gun and there is a sturdy feel to it all. Many of the joints were a bit too stiff at first but freed up after some use. However he is not quite as flexible as his video game counterpart, you can't quite squeeze 90 degrees out of his elbow and knees, or abduct the shoulders by the same degree, although you can rotate them above shoulder level. Perhaps the most curious though is that his hips rotate backwards further than they do forwards, which only amounts to about 45 degrees or so forward. But there is not a lot you could want to achieve in terms of posing that you can't actually do with what is here. The lone Isaac comes with a lone accessory - the 211-V Plasma Cutter. Its not actually a gun as I've referred to it as before. It's a tool which Isaac uses as an ersatz weapon. It's not made of a rigid plastic, which has resulted in the afore mentioned banana-isation of it due to the packaging. You can probably tell from the photos that using this as a cutting tool would not win any awards for accuracy. It has the same symbol detailing as the figure but it doesn't look quite as neat and tidy. There are no moving parts like in the game either. 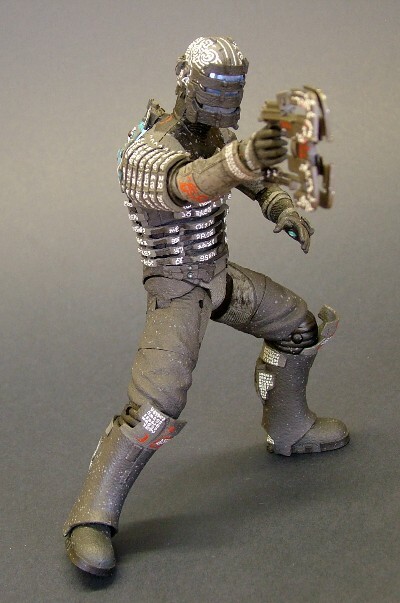 Considering the array of cool tools/weapons in the game, dishing out a single offering is disappointing, although I never know how much to sympathize - perhaps NECA could only afford the one. The light up feature is especially welcome and borderline necessary considering how integral some of it is in the game. 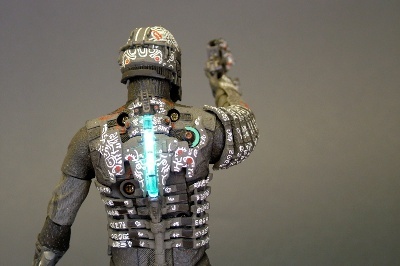 Push the sculptural button on the back of the figure and Isaac's face mask and spine (in the game his health bar) glow. The LEDs are bright. With the lights out this figure doubles up as a torch (kinda). They really give Isaac his signature look and its kudos to NECA for including it. I really like the light up feature, but as much as I don't want to say, it's not a perfect execution. The top of the face is brighter than the bottom as the light emitting from the bottom gets unavoidably diffused due to the clear neck joint within. 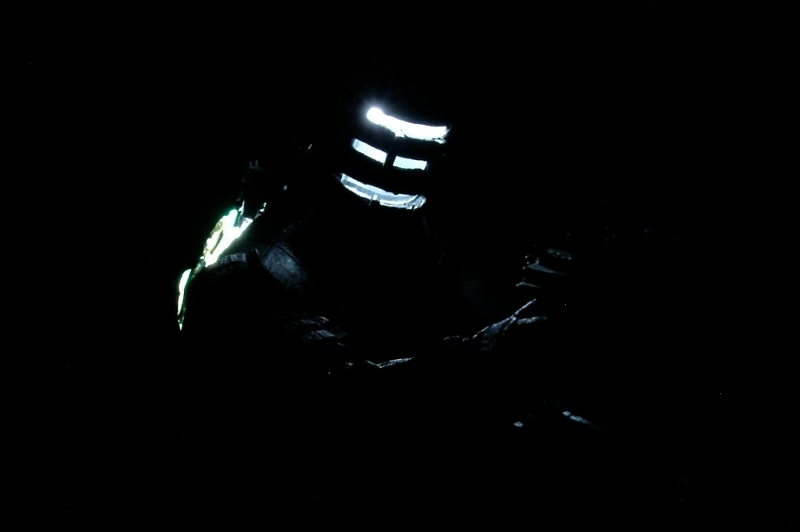 There is also some light bleed from the underside of the helmet, but it's only really noticeable from below. The health bar also has some excessive light bleed which can be seen actually through the paint on surrounding plastic and also from the sides of the fixture, which is raised of the back, but is only really noticeable in low light. Finally you can see from the photos the extensive screw fixings of the light up feature which may or may not bother some. There are other lights on Isaac in the game, such as the blue semi circle on back, holographic projector on his chest, the map projector on the left palm and the lights on the plasma cutter, but they included the most significant ones. One more thing. NECA kindly included some extensive instructions on battery caution. Article 1 states 'Do not use rechargeable batteries'. Article 10 follows this up with 'Rechargeable batteries must be removed from the toy before being charging'. Can't argue with that logic. It moves, it lights up, it looks great. Yeah, there's a lot of fun to be derived from this figure. From Play.com, this figure was 17.99GBP. That is steep considering the regular versions are cheaper but are practically the same. You are paying for the exclusivity here. I think the quality, not the quantity here makes it's retail price seem more reasonable, but it's not a habit one would like to continue. Obviously the bent plasma cutter, and watch out for the stiffness of some of the joints at first. To me, this is an example of where the sum of the parts, in spite of their individual shortcomings, really add up to a superb figure. It depends on your expectations, but it's difficult to focus on the nitpicks of this figure, which are there, when the whole is so competent. 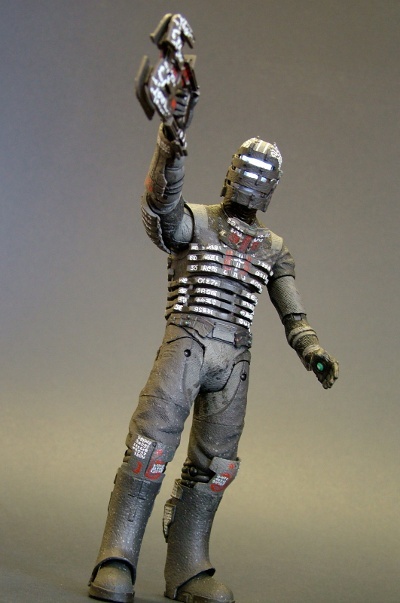 NECA's Isaac Clarke figure might not have been on a lot of people's radar, but fan of the game or not, it's worth a look. - Circle Red has the regular Isaac for $15. 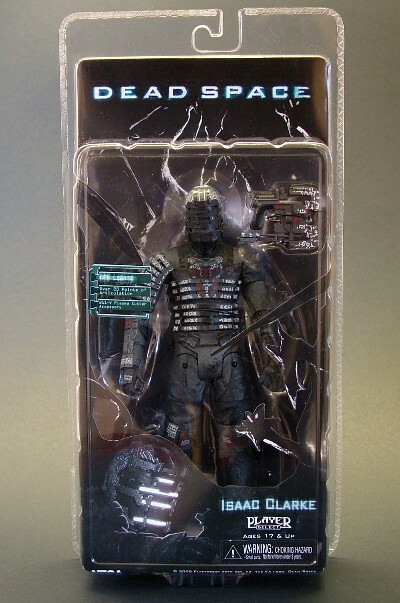 - Entertainment Earth has the two Isaac Clarke figures for $30 a pair. - Things From Another World has a case of figures at $115. - Forbidden Planet has the regular Isaac for 14 GBP.